No surprises here — at our 11th D: All Things Digital technology conference, Apple CEO Tim Cook is still staying mum on the company’s plans for a proper TV set. However! According to Cook, the company sure has seemed to learn from its initial foray into the living room. “There is a very grand vision of this,” Cook said, speaking of television in general, in an onstage conversation with Kara Swisher and Walt Mossberg at the conference. Apple’s answer to that, thus far, has been Apple TV. It’s the company’s modestly priced, fairly limited set-top device. Which, of course, Cook and Apple have maintained for some time is the company’s pet experimental project — a “hobby,” as Cook has said many times over the years. 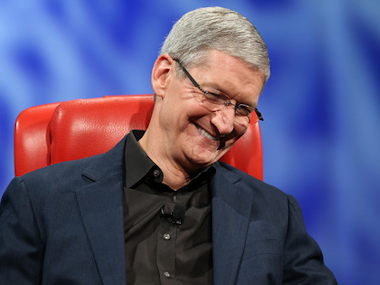 “We answered some of those [problems] — clearly not all of those — through Apple TV,” he said. While the company has seen modest success with Apple TV here — selling more than 13 million since the device debuted — it has been less a flagship product than a sort of learning experience for the company. Does that mean we’ll see a TV set before the year is out? Maybe we’ll know by D12.